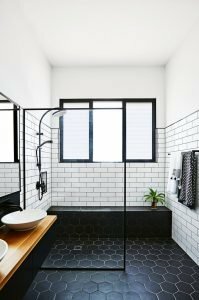 A new year means new trends—check out five of the latest bathroom trends on the rise in 2018. I don’t know about you, but most people I know say the bathroom should be simple—that it really isn’t the place to “take risks.” And that’s fair because styles change and simple is safe and has a longer shelf life. But if you’re like me, your bathroom is your sanctuary. It’s the place where you prepare to meet the day and the place that helps you unwind and relax after it. 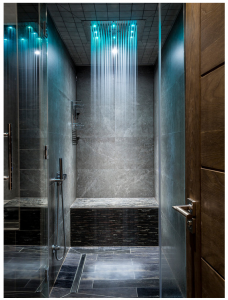 Steam shower anyone? The point is, no matter the style, it’s about finding what you love and making it work for you. 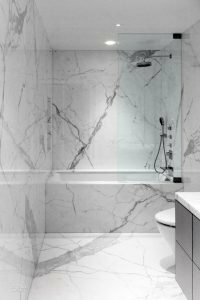 Here are five bathroom trends on the rise in 2018. 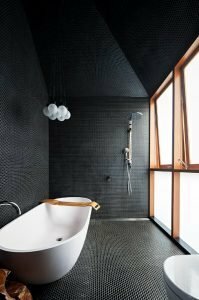 The one-material bathroom made its debut in the 1980s and since the 80s the pendulum has seemingly swung back in recent times, why not embrace it? The one material style is bold yet there’s something relaxing in its minimalist feel. And I only have once to make—pick my tile. Boom. Done. Not only does a floating vanity free up floor space but it can hide the plumbing components and gives your bathroom a more open feel. Which is great if you have a smaller bathroom where every square inch matters, like me. It’s modern and aesthetically awesome. Clean and classic. Marble has that luxurious feel, doesn’t it? Not the most cost-effective, I know, but it makes a statement—especially when the veining lines up like the picture below. Beautiful. No doors, no problem. And another hack for the small bathroom folks! While you may need to keep one glass wall to prevent water from spraying everywhere, I love the open feel and the visual simplicity. “Alexa turn on shower.” Because people are using their phone and tablets more and more in the bathroom (ahem), voice-triggered commands and Bluetooth features are already available on some shower units. So, if you’re a bit of a techie like me—a bathroom with the latest technology is right up your alley. 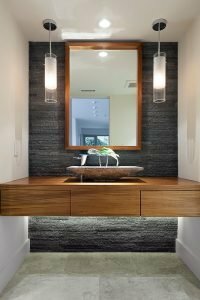 If you’re ready to transform your same-old bathroom into your sanctuary, visit the ACo website at https://liveaco.com or call to schedule your appointment at 317.575.9540. ACo helps homeowners overcome the overwhelming and love where they live by creating luxurious spaces that connect families, rejuvenate individuals, and make their families proud.